When you’re shopping the ever-growing assortment of free templates in E-Learning Heroes, it can sometimes be tough to see past a template’s existing colors, features, styling, or layout to envision how it can be applied to your project. Do you skip those templates … or simply pluck what works? I’ll explain: I like to think of our free e-learning templates as a collection of layouts I can mix and match as I need—sort of like an assortment of tasty ingredients I can combine in different quantities to achieve completely different recipes each time I use them. When you have this mind-set, using multiple templates for their component parts can actually be a huge timesaver since they can save you some of the heavy lifting that comes with building interactions from the ground up. To prove my point, I decided to challenge myself and see how many free templates I could remix into one cohesive Storyline project. After laying out a basic structure and surfing the Downloads hubs, I ended up with four free Articulate Storyline templates and one free PowerPoint template I combined into one new Storyline project. Before you start searching for template layouts, it’s a good idea to have a structure in place so you can focus on finding template layouts for the menus, click-and-reveals, video galleries, and other complex interactions, since those are the most labor-intensive slides to build from scratch. It’s also helpful to have a general sense of the visual design you’re going for—e.g., a flat design look vs. stock photo images, and a color palette you’d like to stay within. This will help you narrow down your options and save you time later. E-Learning Heroes templates are all conveniently grouped in the Downloads hub. A click of the templates drop-down reveals all of the templates organized by product. 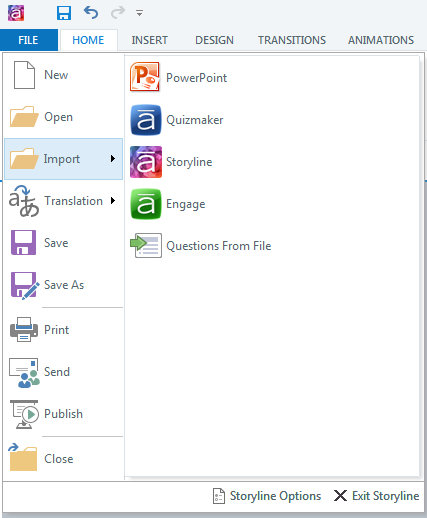 For my project, I chose a mix of Articulate Storyline and PowerPoint templates, but Storyline supports importing Articulate Engage and Articulate Quizmaker interactions as well. Clicking this link gives you a chance to see a published, functional version of the file before you download. This is helpful for selecting individual interactions you can repurpose in your project, as you can see how everything behaves before you commit to downloading and importing it into your file. For my project, I tried to choose templates that shared a similar color palette and graphic style (flat graphics). I also tried to stay true to their basic function. In other words, if the layout started out as a click-and-reveal interaction, I tried to maintain that functionality. 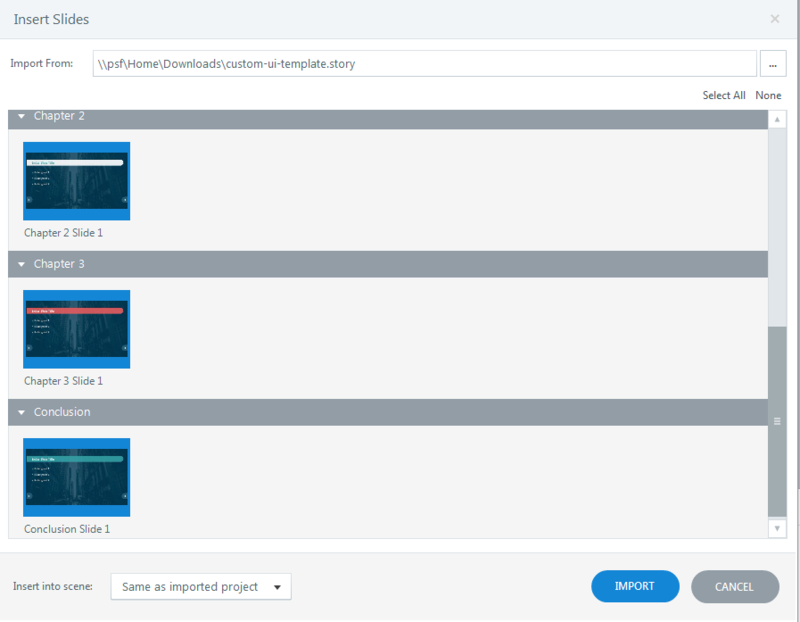 Once you’ve downloaded the template files, you can import them into Storyline. In Storyline, you’ll find the import option under the file menu. After you choose the file you’d like to import, Storyline lets you view all of the newly imported project slides by scene. Storyline gives you the option to import individual slides or the entire project file. This is where you'll choose only the layouts you need for your project. Importing slides from multiple project files will leave you with something of a mess at first. But the good news is that the gratifying work of stitching your project back together will go quickly now that you’ve got all the layout slides in place. To kickstart the transformation, I like to begin with the slide master view, where I unify the layouts I’m using with a consistent color palette. Often this is as simple as changing up the background color and the typeface(s), but in some cases you may need to update slide master layers and the states of objects on the slide master as well. When you’re done with the slide master you can turn your attention to refining individual slides and interactions. Place your content on slides, layers, and object states; swap out graphics; and add consistent navigation and prompts throughout to complete the transformation. When you import only portions of a project file, it’s likely you’ll end up with a few broken triggers for slides or objects that no longer exist in your new project. Before you start previewing your work, spend a few moments reviewing the triggers panel for each slide and address any of these broken links. Storyline makes spotting these a little easier by changing their color to red. Still doubting whether carefully combining slides from an assortment of templates can result in a unified look? Check out my newly unified project. Not too bad for an hour of work, right? 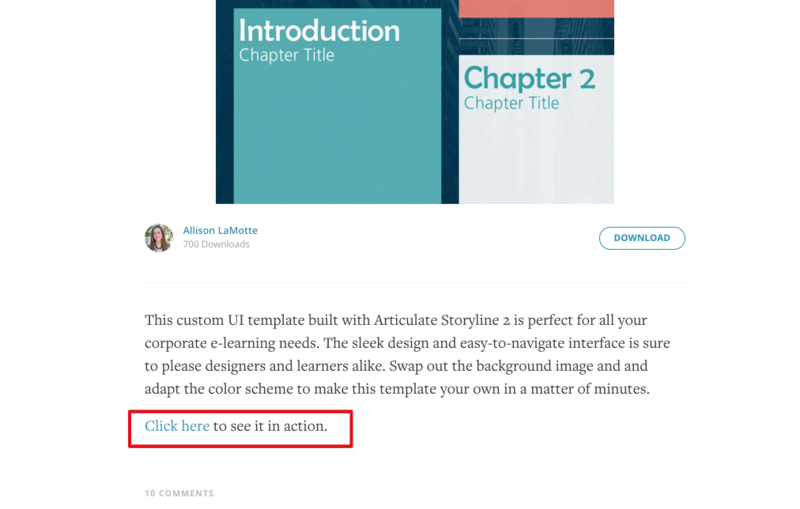 I also found design inspiration by reviewing the ideas shared by the E-Learning Heroes community for Weekly Challenge #65: Examples of Blended Template Designs—especially from Jackie VanNice's post on this topic. Have you repurposed one (or many!) of our free download templates? If so, leave us a comment below to share your experience. If not, give it a try and tell us how it goes. Great work Trina, very nicely done! Thanks, Matt! It was a fun challenge and I'm pretty happy with the results. This is awesome, Trina! I am amazed at how cohesive this looks.You would never know this was made from 5 separate templates. Great work! Thanks! I really feel like it all came together well—and quickly. Thanks for letting me "borrow" your template, Allison.